Mix the flour, salt and yeast in a bowl. Add the maple syrup and milk, mix and knead into a soft, smooth dough. Cover and leave to rise at room temperature for approx. 1 hr. until doubled in size. Divide the dough into 12 equal portions. Shape each piece of dough into a roll approx. 60 cm long. Fold the rolls in the middle. Twist the ends of the rolls several times, creating a large loop at the bottom. Bring the twisted part down to touch the bottom of the big loop and press firmly to secure. Bring the water to the boil, add the bicarbonate of soda. Using a slotted spoon, dip the pretzels individually into boiling water for approx. 30 secs., drain, place on a tray lined with baking paper, sprinkle with salt while still damp. Bake for approx. 15 mins. in the centre of an oven preheated to 200°C. 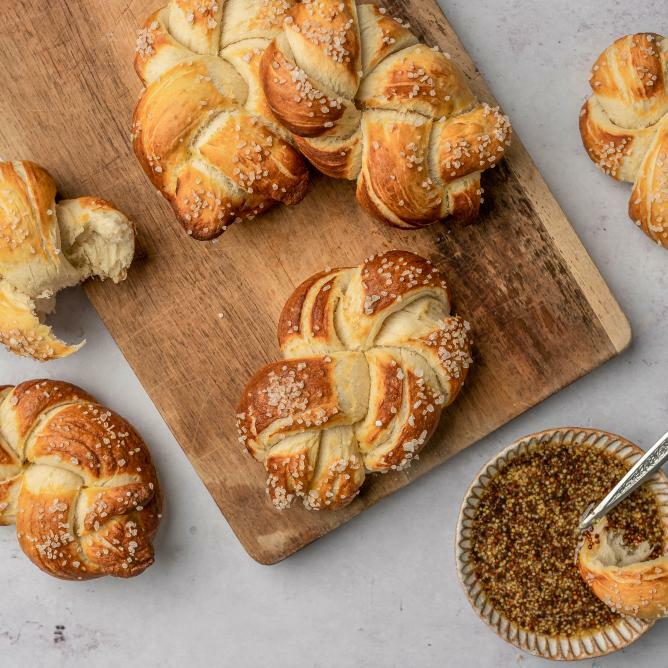 Combine all the ingredients and serve with the pretzels.